Series 638 Pressure Transmitters employ a polysilicon sensor for superior longterm stability and repeatability with ±0.5% accuracy. They are FM approved intrinsically safe. Stainless steel NEMA 4X enclosure is ideal for corrosive media in hazardous environments. Output is 4-20 mA with 10-30 VDC power supply. NIST traceability with calibration certification is standard. 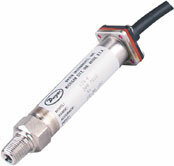 The 638 Series Pressure Transmitter is ideal corrosive media in harsh environments! The Standard 638 Model is more ecnomical!